1. 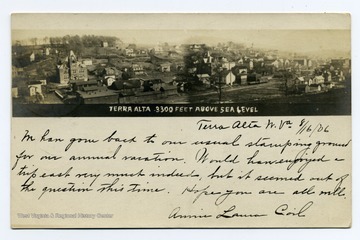 Terra Alta, W. Va.
Terra Alta, W. Va. is 3300 feet above sea level. 2. 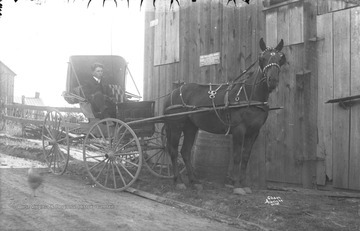 Young Man Sits in Horse and Buggy Next to Home Monumental Works Barn, Terra Alta, W. Va.
Young Man Sits in Horse and Buggy Next to Home Monumental Works Barn, Terra Alta, W. Va. 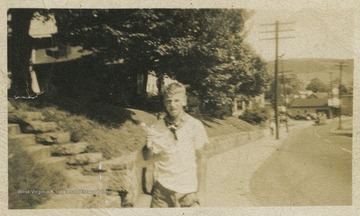 Unidentified young man with a cigar in his mouth holds the reins while parked next to a shop which carves headstones and cemetery monuments. 3. Portrait of Harold H. Miller of Preston County, W. Va. 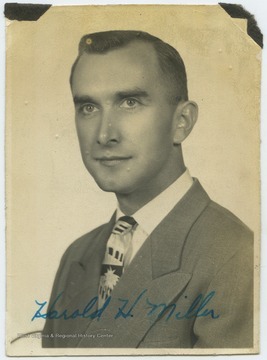 Portrait of Harold H. Miller of Preston County, W. Va.
Miller (b. 11/24/1911-d. 11/8/2006) was the son of Henry C. and Marguarite E. Miller. He was a life-long school teacher at Terra Alta High School. He served in both World War II and the Korean War. 4. 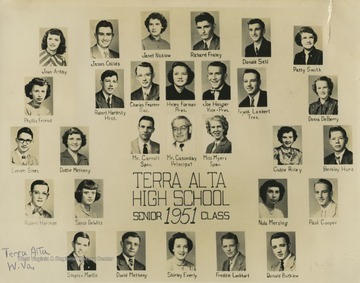 Terra Alta High School Senior Class, Terra Alta, W. Va.
Terra Alta High School Senior Class, Terra Alta, W. Va.
Pictured are Joan Ashby; Donald Bucklew; Mr. Carroll; Mr. Casseday; James Childs; Paul Cooper; Donna DeBerry; Sarah DeWitt; Shirley Everly; Charles Feather; Helen Forman; Richard Fraley; Phyllis Friend; Robert Hardesty; Robert Harmon; Joe Hauger; Berkley Hurd; Frank Lambert; Freddie Lockhart; Stephen Martin; David Metheny; Dottie Metheny; Nola Mersing; Miss Myers; Janet Nicklow; Cubie Riley; Donald Sell; Everett Sines; and Patty Smith. 5. High School Portrait of Sarah Lou DeWitt, Terra Alta, W. Va.
High School Portrait of Sarah Lou DeWitt, Terra Alta, W. Va.
Photo of DeWitt during her years at Terra Alta High School. 6. 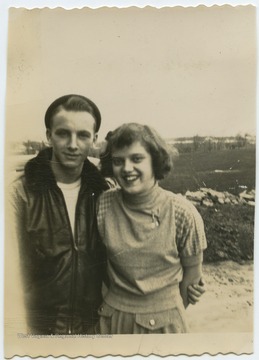 Paul R. Cooper and Sarah Lou DeWitt, Terra Alta, W. Va.
Paul R. Cooper and Sarah Lou DeWitt, Terra Alta, W. Va.
Cooper, left, and DeWitt, right, pose together for a photo during their senior year at Terra Alta High School. 7. 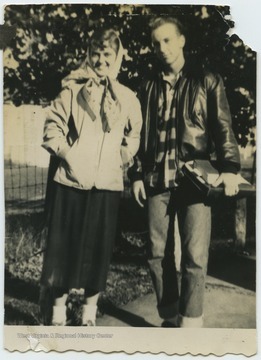 Sara Lou DeWitt with Paul R. Cooper Outside of High School, Terra Alta, W. Va.
Sara Lou DeWitt with Paul R. Cooper Outside of High School, Terra Alta, W. Va.
DeWitt, left, and Cooper, right, pose outside of Terra Alta High School during their senior year. 8. 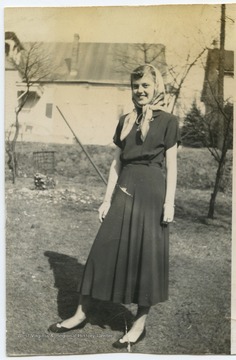 Sara Lou DeWitt, Terra Alta, W. Va.
Sara Lou DeWitt, Terra Alta, W. Va.
Candid photograph of DeWitt during her senior year at Terra Alta High School. 9. 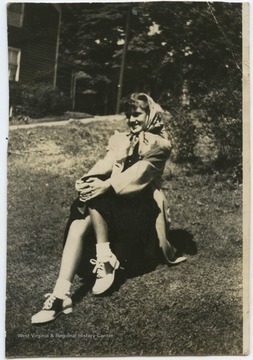 Sarah Lou DeWitt Outside of Terra Alta High School, Terra Alta, W. Va.
Sarah Lou DeWitt Outside of Terra Alta High School, Terra Alta, W. Va.
Photo of DeWitt during her senior year at the high school. 10. Paul Cooper during Freshman Week, Terra Alta, W. Va.
Paul Cooper during Freshman Week, Terra Alta, W. Va.
Cooper pictured during his freshman year at Terra Alta High School. 11. 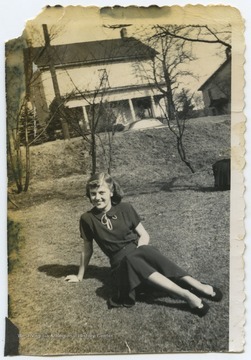 Sarah Lou DeWitt Sitting on Lawn, Terra Alta, W. Va.
Sarah Lou DeWitt Sitting on Lawn, Terra Alta, W. Va.
DeWitt relaxes on the grass during her senior year at Terra Alta High School. 12. 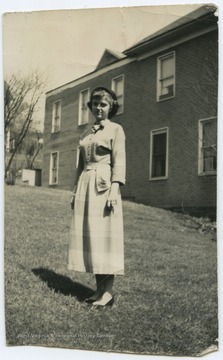 Sara Lou DeWitt, Terra Alta, W. Va. 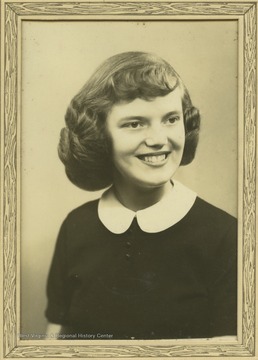 Portrait of DeWitt during her senior year at Terra Alta High School.